Understanding the growth/regrowth habits of an individual grass easily translates into management decisions. However, when different grasses or grass/legume combinations are growing together, which may result from planning or from weed infestation, the management decisions require more strategy. and reduce susceptibility to insect and disease attacks. If hay or silage making is the goal, the thoughts of using mixtures should consider those species that can be harvested at the same time.Here is a graph depicting a probable pasture production for perennial ryegrass in the northern hemisphere. As you can see, there are times when other feed will be needed. Utilizing another grass or legume that flourishes during the less productive periods for perennial ryegrass extends the season of production and maintains the quality of feed. Mixtures can improve the feed quality. Legumes have a higher protein content than grasses. Growing animals have a high protein requirement that can be met to a large degree by adequate legumes in the forage mix. Furthermore, the palatability and digestibility may also be improved. Although planting a legume with a grass does not mean all nitrogen fertilizer needs will be met, grasses can eventually benefit from being planted in soil where legumes fixed atmospheric nitrogen. 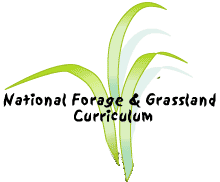 A mixture of species in a pasture can adapt to a wider range of conditions. Some species tolerate wet conditions, some dry, some acid, and some alkaline or sodic soils. Mixtures provide some insurance to unexpected conditions or a variety of conditions which may occur in a single pasture. A rule for mixtures is "remember simplicity". A large number of species in a mixture, sometimes called a "shotgun" mixture, should be avoided. Often a single grass and a single legume will best provide the benefits intended.